In my humble Wino opinion, a birthday should always be celebrated with a good bottle of wine. When I first enjoyed this week’s Divine Wine, it was during a birthday celebration with a bunch of friendly Winos. We ordered the bottle, none of us knowing quite what to expect. We had the obligatory birthday “cheers’ing”…. and then we each took a sip. Although it was now five years ago, I remember the moment clearly. I took a sip, and then – with the glass still held up in front of my face, I lifted my eyes from the glass and made eye contact with one of the other winos at the table. We held that eye contact for a moment, knowing we were both thinking the same thing. We were both in love…. with the wine. Since then, I’ve had this wine a number of times and each time, have found myself savoring each sip (or gulp) from my glass. Price Range: $15-20 at Costco, Total Wine, and most likely your favorite wine shop. Wino Assessment: As previously noted, upon the first sip, there was nothing but love for this wine. It is dry – has that woody/oaky flavor. But not at all chalky. It also has a bit of that dark fruit flavor (plums, perhaps) that balances the dryness without making it too jammy or sweet. In a way, this wine goes down like a smooth cup of coffee. 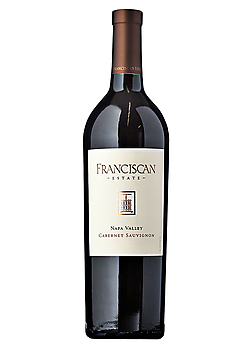 As you enjoy a few sips of the Franciscan Cab, the swirl of flavors are so satisfying that I swear you’ll suddenly start taking smaller sips because you just want it to last longer. Aromas: Complex and vibrant aromas of red plum, anise, cherry, violets, and tobacco accentuated by notes of black currant, dried herbs, toasted oak, and cocoa. Flavors: Elegant and supple texture on the palate make the frame for generous flavors of sweet plum and dark cherry, with notes of vanilla and mocha. Silky tannins and well-integrated structure tie together and linger in the finish. The winery also has a nice write-up of the history of this wine, if you’re interested in reading more. 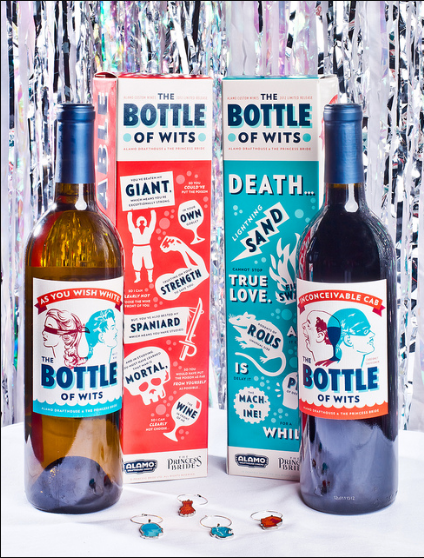 Divine Wine Bite: So now that you have the wine in hand, what should you eat with it? Cabernets generally have a lot of tannins, which typically make the wine taste a little more bitter (in the same way that dark chocolate might taste bitter), and also makes it taste dry. Because of that, Cabs tend to go well with red meat. The red meat’s protein and fattiness balance the bitter/dryness of the wine. So try this wine with a nice grilled steak or grilled lamb. I personally enjoyed it with this delicious burger tonight! As usual, the winery description of the wine, once I hear it, seems spot on. “Herbal notes” and “black fruit” and “a little smoke”… I wouldn’t say my description was spot on, but I don’t think it was too far off! (Am I giving myself too much credit??) Also, when they say, “long lasting finish”, all I can think is, “exactly! THAT’s what I meant!” PS: I am going to incorporate “herbasceousness” into my daily vocabulary. 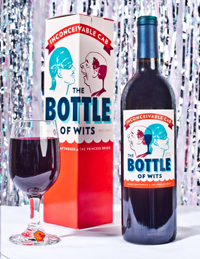 So there it is – the Divine Wine of the Week. If you try and of Niner’s wines, I’d love to hear about it! Winos – let’s be honest. A lot of times we pick a wine out at the wine shop not because of the vintage or our Wine Know regarding that region or varietal or anything of the sort. We pick it because of the label. And THAT is exactly why I picked up Kung Fu Girl Riesling. After I got home and looked at the label a little more closely, I realized this wine is made by a winery with which I’m already familiar – Charles Smith Wines. I’ve tried their Boom Boom Shiraz (at La Grande Orange in Phoenix and elsewhere) and their Chateau Smith Cabernet Sauvignon (at Kazimierz in Scottsdale) – the latter being one of my favorite wines, but both I enjoyed immensely. Ordinarily, I think of Rieslings as overly sweet and – not having a sweet tooth when it comes to wine – I do not usually seek it out. However, earlier this week, I was talking with Sister Kai (my actual sister, not a nun) who commented on how she enjoys Rieslings… AND I read something about how Rieslings pair with many different types of food. So I took it as two indicators of needing to study up a bit on Rieslings. And when I came across one from a winery that I knew I liked, it just seemed that the stars had aligned. I approach Rieslings with a bit of an attitude to start – primarily because of that presumed sweetness factor that I previously mentioned. But if I had to guess what Kung Fu Girl was on a blind taste test, I probably would have guessed a Pinot Grigio. The wine had flavors of apples and peaches or apricots and was very light and delicious. Cousin K enjoyed the bottle with me and she has a similar feeling regarding Rieslings. But for the sake of the blog, she went with it, and we both were pleasantly surprised at how enjoyable the wine was. Overall, it was light and easy to drink – it was sweet, but not sugary sweet – it was appley sweet… which was lovely. 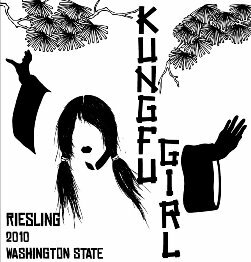 As stated, I always associate these wines with über-sweetness, but Kung Fu Girl – while sweet in a fruity way – was not über-sweet. (Do you like my use of a German word in the post about wine originating from the Germanic regions!?!). I would indeed go and get another bottle of this wine to enjoy it on multiple occasions. In general, Riesling typically has flavors of ripe peaches, apricots, and melons, and sometimes a mineral-like quality (The Wine Bible). But what does Charles Smith have to say about Kung Fu Girl? Riesling’s home is Germany and is very popular in Austria and Alsace (which is the French side of the Franco-German border). But Kung Fu Girl comes from Columbia Valley in Washington State. This state is known for its “bright fruit and relatively crisp acidity” in wines (The Oxford Companion to Wine). White grapes are the most commonly planted grapes in the state, and Rieslings in particular do especially well. The region in general prides itself on high value wines for less than high dollar (something most of us Winos appreciate). I especially hope you all give this wine a try as it was surprisingly delicious in my humble Wino opinion (for Ms. Snodgrass, that abbreviation is IMHWO). If you do, let me know what you think! Happy Divine Wine Sunday! !… or Monday. I seem to have a rough time getting my post completed on Sunday… but hey, wine is divine no matter the day, right? One of my favorite places to shop is Costco. Yes, I am just one person, but I have an enormous refrigerator and lots of cabinet space. So buying the 5 gallon jug of dish soap or 24 cans of tomato sauce or 20 breasts of frozen chicken is not really a problem. And guess what else isn’t a problem… the wine section! Despite Costco’s packaging of most products in at least a two-pack and up to a gazillion-pack, they do offer regular old single bottles of wine for excellent Costco prices. I don’t often buy the same bottles of wine from wine stores – primarily because I like to try something new, and there are so many wines out there to taste. But Costco, in all its glory, has a relatively small selection of wines that I find very enjoyable for a very reasonable price. That’s their thing… offer less of a selection of wine, but keep the value high. Of the “Kirkland” labeled wines, I have found all that I’ve tried to be quite tasty, and I’m repeatedly purchase the the same wines from the warehouse. So today, I am highlighting the one that I consistently look for on every Costco adventure. Price Range: $12.99 at Costco! Cabernet Sauvignon. I feel like we have talked about this grape already on Wino to Wine Know, but apparently we have not – not on Divine Wine Sunday (or Monday) anyway. Cabernet Sauvignon (which I will refer to as “Cab” from hereon out in this post), is one of two of the world’s most popular grapes. (Merlot is the other.) It is a dark-skinned grape variety and it is based out of Bordeaux in France. Cab grapes are typically mixed with other grapes to make a Bordeaux wine, but there are certainly plenty of wines that are 100% (or majority) Cab. This grape has an ability to help a winemaker use the grape to make the wine that s/he wants to make. It is highly dependent on the terroir (the elements associated with the climate and soil and many other factors of where the vines are planted… more on terroir in a future post), and is a good candidate for longer bottle aging (meaning, Cabs may sit in their bottles for years and become one of those wines you save for a special occasion). An interesting fun fact about Cabernet Sauvignon – its “parent” grapes are believed to be Cabernet Franc (a black grape) and Sauvignon Blanc (a white grape). This development was believed to have happened way back when (that’s an official time period) via some mixture of the two “parent” vines. Cabernet Sauvignon is a crucial part of French wines, where it is commonly blended with other grapes. Why blend? Well while the Cab provides “structure” and has a lot of tannins, it needs to balanced by other grapes to make the wine interesting. While the French often blend their Cab grapes with others, Napa Valley offers a lot of 100% / majority Cab grape wines. Because of this, the Napa Cabs tend to be “dense, purple-black, jammy and tasting of currants and black cherries.” (The Wine Enthusiast Magazine) I really like Bordeauxs and I really like Cabs, so I guess I’m a winner either way! Costco doesn’t offer a lot of info about their wines, in particular their Kirkland Signature labels. But they do offer a Costco Wine Blog! (Who knew!?!) Check it out – it shares a bit about what Costco offers in general when it comes to wine. You may be wondering about the Kirkland Signature label. If you’re not a Costco shopper, you should know that “Kirkland” is Costco’s brand name (I believe that is due to their home base of Kirkland, Washington, where one of my favorite Dreamers was born.) According to Serious About Wine, Costco serves as a distributor for small lots of wine and slaps their label on the bottle. (Ok, there’s probably a bit more to it than that…) They are small lots in general with about 2000 cases – which is possibly big for a winery, but small for a major warehouse like Costco. If you check out the post on Serious About Wine, you’ll learn a bit about the distribution methodology that Costco has laid out with regard to the “Kirkland Signature” label. 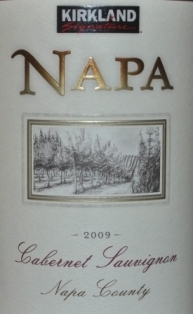 “This is a good mid-week, everyday Napa Cab that’s $12.99 at Costco.And the wine is good, nice for the price, and after some air it started to open up into a fairly decent wine. So Cabs are among the most popular grapes to plant in the wine world. But here on this post, I am only going to talk about California since this Cab is from that fine state neighboring my home state of Arizona. Apparently Cabs are the basis fo the “California Cult” wines. What, you ask, is a “California Cult” wine? Well, apparently it was a phrase used in the 1990s that were typically Cabs (but not exclusively Cabs) made in California and typically Napa Valley for which high rollers would pay higher prices than that of Bordeaux’s “first growths” (to put it simply, top ranking wines in Bordeaux). So as you can imagine, Napa loves its Cabs… as does the world of wine drinkers. It is an important grape across the world and will certainly be highlighted on this Wino’s world wide web space in the future!! 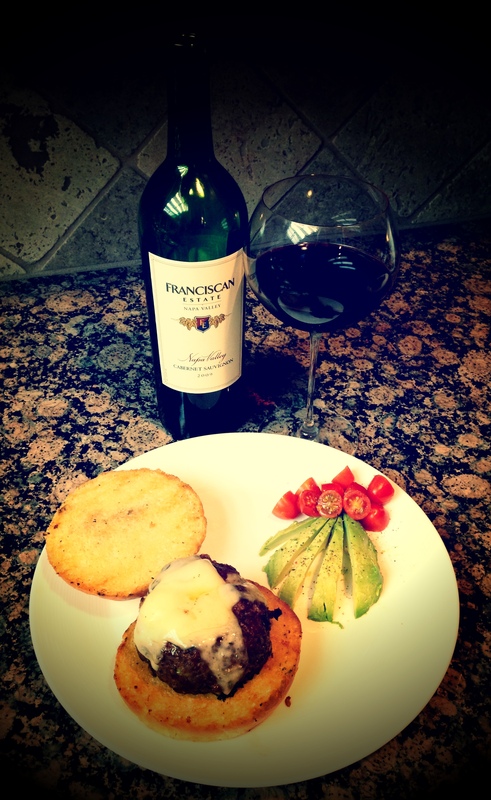 Hope you feel like you “Wine Know” more about Costco wine and Napa Cabs!! Have you tried this Costco wine or any of their other Kirkland Signature labels? What did you think!?? !